Carnegie Mellon University will dramatically increase the accessibility of its transformational educational programs by meeting more of the financial aid need of current and future undergraduate students thanks to a landmark commitment from two of its alumni. 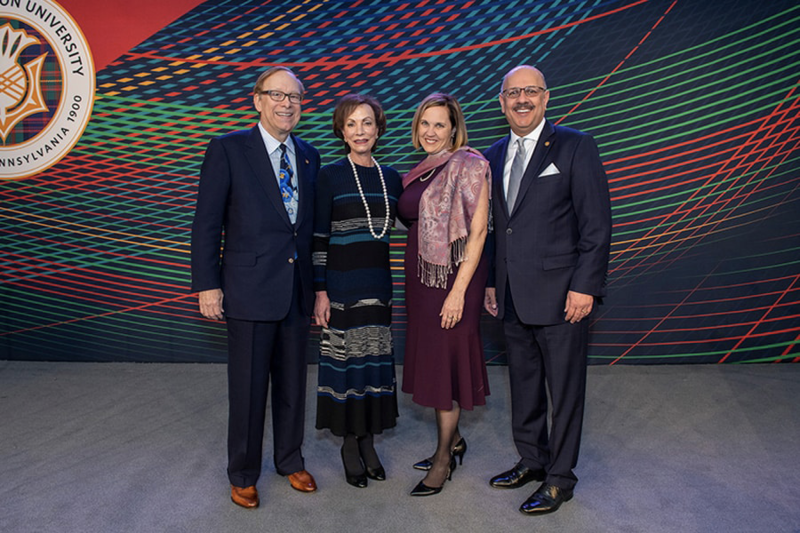 Cindy and Tod Johnson have pledged to contribute $50 million to an endowment that supports scholarships, as well as persistence activities that help students stay on their path to graduation. The commitment is the largest single gift for scholarship support in Carnegie Mellon's history. It was announced by CMU President Farnam Jahanian during his inauguration speech on Oct. 26. When fully funded, the Johnson Family Scholarship Endowment will provide significant critical resources to help meet the financial need of future generations of undergraduate students. In addition to scholarships, the endowment will give the university flexible funding to address issues that can force students to leave without completing their degrees. "A Carnegie Mellon education and the unique experience our students gain during their time here is nothing short of life-changing. Especially at this time of societal transformation brought on by advances in technology, the world needs more CMU graduates who are prepared to lead this transition," Jahanian said. "We are awestruck by Cindy and Tod's generosity and thrilled at how their support will greatly expand our ability to ensure a CMU education is within reach of all students." In the past decade, CMU has increased the average grant it gives to students receiving aid by more than 84 percent. However, as the university provides increased scholarship support to ensure students with the most demonstrated need have access, students from middle income families find themselves increasingly priced out of a university education. The Johnsons' commitment will provide more resources for the university to address both lower and middle income students over the long term. "Interest in Carnegie Mellon from students around the world continues to grow at an extraordinary pace, which we saw with a 19 percent increase in applicants last year. But prospective students and their families tell us the number one obstacle is the cost of attendance," said Michael Steidel, dean of admission. "Scholarship support like that made possible through the Johnsons' tremendous generosity gives us the tools to help more of these talented students say 'yes' to CMU, their top choice." Cindy and Tod Johnson met and married while they were both students at the Carnegie Institute of Technology, which became Carnegie Mellon University during their time on campus. Tod earned a bachelor's degree in graphic arts management in 1966 and a master's degree in industrial administration in 1967. Cindy earned a bachelor's degree in art in 1968. "This is a gift that Cindy and I have always wanted to make. I see the societal and social effects of student debt in the lives of recent graduates whom my company hires and through our company's research on consumer spending; it is becoming more apparent than ever before. Also, we have wanted to make this gift because it was the support of a fellowship I received that made it possible for us to be independent as CMU students," said Tod Johnson, who chaired the Presidential Search Committee that selected Jahanian. "We've been involved with CMU our entire adult lives and provided contributions during six CMU presidencies, but this one has a special meaning because of how we benefited from the financial aid I received. We felt it was important to show our support of President Jahanian at the start of his presidency, but even more importantly, we hope that this gift makes it possible for many more students to choose Carnegie Mellon without taking on a financial burden." Tod is the executive chairman of The NPD Group, Inc., a global market-research firm that he has led for over 45 years and that is used by more than 2,000 companies around the world to measure, predict and improve performance across all channels. A longstanding member and vice chair of CMU's Board of Trustees, he also chaired the Centennial Campaign for Carnegie Mellon. In 2017, Tod was awarded the Tepper School of Business Lifetime Achievement Award. He is a managing director of the Metropolitan Opera. Cindy is co-chair of the board of directors for St. Mary's Healthcare System for Children in New York. The Johnsons' previous gifts to CMU include the establishment of the Herbert A. Simon Professorship of Economics and Psychology, support for the recently completed first building on the Tepper Quadrangle, support of the Purnell Center for the Arts, and an endowment for the university's Fifth-Year Scholars Program. "Carnegie Mellon has meant so much to Tod and me from our very first days as undergraduates," Cindy Johnson said. "Financial aid played a key role as we began our lives together, and we look forward to many generations of students seeing how their world opens up because of something so simple yet important as a scholarship." Read President Jahanian's message to the CMU Community.